Small and medium businesses are a growing target for cybercriminals. Using the internet, data thieves attack and steal your customers’ payment (debit and credit) card data to commit fraud. This data is especially at risk when it travels to your merchant bank, and when it’s kept or stored on your computers and devices. 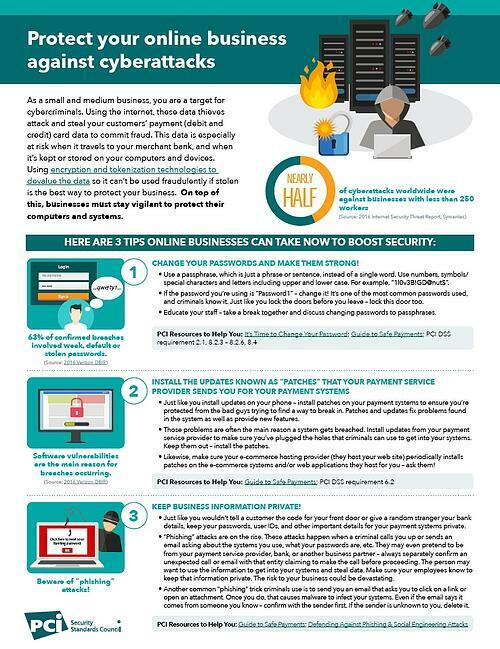 Read this PCI Security Standards Resource guide for three tips to protect your online business from cybercriminals.